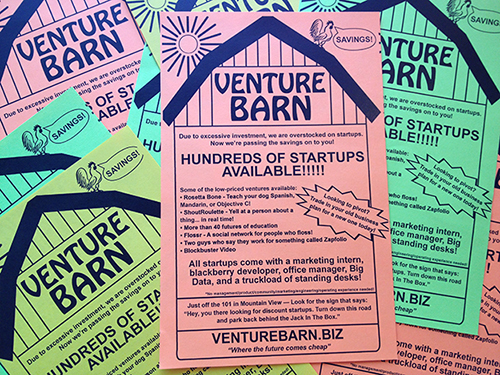 Now that Comedy Hack Day is a glimmer in the rearview mirror of our gold-plated Tesla, it’s time we discuss something very serious and dear to our heart: Venture Barn. As a rather soft promotional stunt for Comedy Hack Day, I had the idea to print and distribute some neon flyers for some non-existant startup or tech entity, then distribute them during SF Sketchfest. After some group brainstorming we agreed to create Venture Barn, a factory-direct outlet mall of sorts for discount startups. From there, it became simple. Write some jargon-riddled blowout sale text (“Looking to pivot? 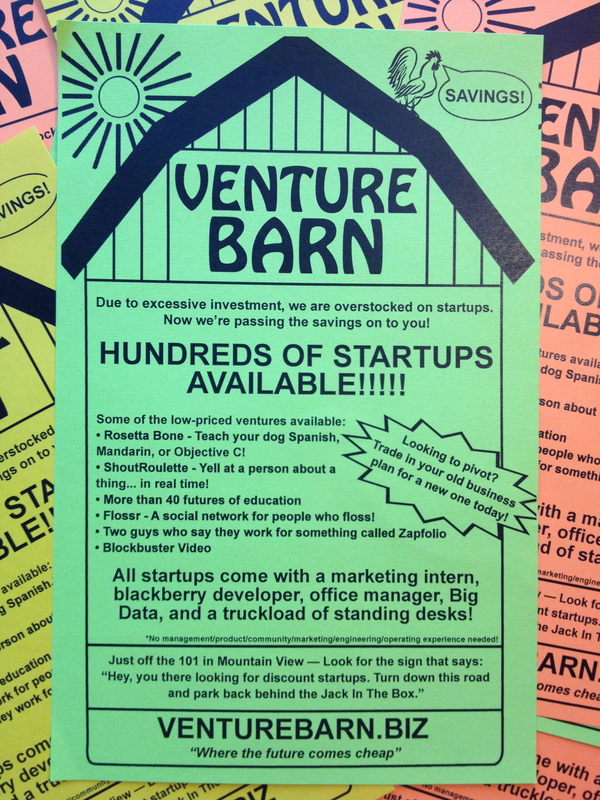 Trade in your old business plan for a new one today!”), invent some absurd fake startups (“More than 40 futures of education”), and design a hokey looking barn-themed flyer. The rooster is probably my favorite touch of the whole thing. Craig even went one further and purchased venturebarn.biz and created a picture-perfect site. That’s all. No real point to this post other than sharing what I am going to call the most significant contribution Cultivated Wit has made to society to date.